Okay – sitting in the park on a buggy summer night is not exactly my idea of fun. There has to be something of worth to make this kind of sacrifice. I took a loaner lawn chair from the box office and was grateful to see that the park provided insect repellant for a voluntary donation. I gratefully slipped a buck in the jar and took my place on the lawn in Austin Gardens. There was a lovely pre-performance from the newly formed Oak Park Opera Company. A soprano and tenor performed selections from Verdi and Puccini to warm up the crowd. The music was quite beautiful and set the mood for a very cultured evening. 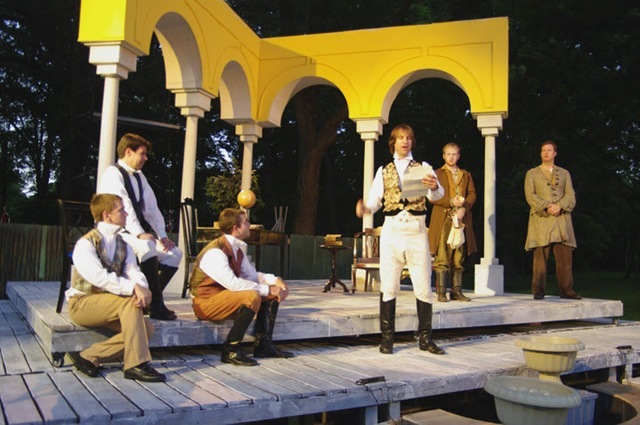 The cast from the play mixed about on the perimeter of the stage, playing bocce in the characters of men at court. When the action began it flowed smoothly as if they really were bystanders in the park. Love’s Labour Lost is not as popular as other works written by Shakespeare, despite the facts that it is one of his funnier plays. The language is less convoluted and ornate – but it is that simplicity that makes this a deceptive pleasure. The audience gets more of a voyeuristic look into life and the social games that may have occurred in the Elizabethan court. 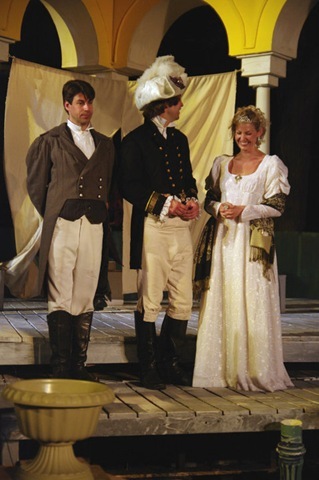 Love’s Labour’s Lost is one of Shakespeare’s earlier comedies, setting the bar for future farcical comedies full of ribaldry and mistaken identity. Comedy requires a cast to work hard without appearing to try. Kudos to the cast of the Oak Park Festival Theatre for pulling off this feat with grace and skill in spite of a sound system that battled the seemingly endless parade of air traffic overhead and blaring night insects below. Also, a little program coordination would be in order so that the actors don’t have to compete with amplified street performances a block over. I was able to tune out the distractions for the most part as the play unfolded. Adam Breske as King Ferdinand shone as the pompous monarch setting an impossible social standard on his young attendants. Joseph Wycoff played the Lord Biron with sparkle and a wink to Walter Matthau. Mr. Wycoff has a great face for the frustration and trickery that ensues. It is Lord Biron who is the last of the king’s court to agree to a vow of celibacy and intense scholarship. It is Wycoff who shows the best and funniest reaction as the one who admits his own hypocrisy last when all are revealed as having broken their vows. The performance of Stephen Spencer as Don Adriano de Amado – a fantastical Spaniard – is a wonderful mix of buffoonery with Kabuki subtlety. 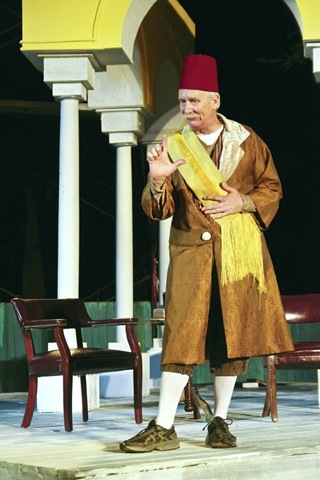 Mr. Spencer is also a wonderful speaker of Shakespeare’s rhythms with sharp and well-placed inflections. No pun is left unturned without perfect inflection hitting the target each time. Charlie Cascino makes brief but crazy energetic appearances as Country Wench Jaquenetta. Ms. Cascino’s mischievous smile and frisky demeanor are perfect for scenes with the clown Costard, played with equally great skill by Bryan James Wakefield. Richard Henzel plays the character of Holofernes, a character is pivotal to the wonderful confusion and double takes that ensue with letter exchanges and identities. Henzel is a Chicago theater veteran and takes firm command in this role. The scenes between Holofernes and Sir Nathaniel are comic gems. Two of the audience’s favorite performers are the thoroughly enjoyable Skyler Schrempp as Don Armado’s attendant Moth and Robert Tobin as Dull the Constable. They both have a gift for physical comedy and verbal timing. Love’s Labour Lost is not one of Shakespeare’s best works in regards to women roles. Katherine Keberlein is regal as the Princess of France, but she and the other ladies in waiting do not match the frenetic energy of the people in King Ferdinand’s court. This is partially due in part to Shakespeare’s interpretation or society women of the late 1500s, as well as the also the directing choice of reigning in the female cast a bit more than the male cast members, which is a wise choice by Artistic Director Jack Hickey. All in all, Shakespeare Under The Stars is a great idea. You will have to make some concessions for the environmental sounds that hinder full enjoyment, but a night out in a wonderful town with a big city feel more than makes up for this. 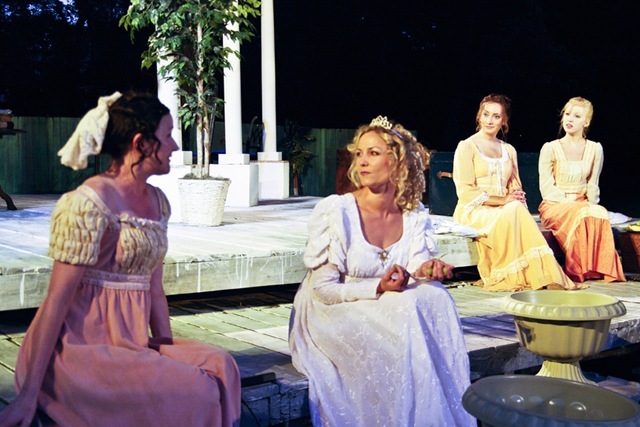 Love’s Labour Lost plays through August 21st at Austin Gardens in Oak Park. The park is a block away from both the Metra and the Green Line. If you take the Metra please pay attention to the schedule as it has an intermittent nature (Metra schedule). It could happen that you end up in Wheaton like I did. Go early to catch the great sidewalk sales and community energy that is Oak Park. Be aware that Oak Park basically closes the sidewalks at 9:00, so either arrive in Oak Park early enough to dine at a restaurant before the performance, or bring a meal and a beverage (wine is allowed) because there is nada après theatre to be had. Check online at www.oakparkfestival.org for availability and ticket information. Bring your insect repellant or at least leave a tip in the donation jar if you use the park’s resources.